Superficial hoof wall cracks are small cracks in the hoof wall, or microcracks – a little larger than the size of a hair. Although these cracks do not have any structural effects on the hoof, they can weaken the attachment between the hoof wall and sole and lead to larger cracks or bacteria build-up. To ensure strong and healthy hooves, it is important that horse owners and farriers address superficial hoof wall cracks with proper support before the cracks become a bigger problem. Although some horses have predisposed, internal structural issues that can lead to cracks, the main cause of microcracks in the hoof wall is often moisture fluctuation. Horses’ feet thrive with consistency, especially when it comes to moisture content. When horses switch back and forth from wet to dry environments, the moisture levels in the hoof become inconsistent, which can cause superficial cracks in the hoof wall. Horses can encounter these changes in moisture four to six times a day – from a dry stall, to wet mud, back to the stall, then to the wash rack and so forth. Bacteria build-up – Superficial hoof wall cracks can expose the foot to an excess of bacteria. If left untreated, bacteria can build up, which makes it harder to maintain a healthy hoof wall. Weak sole attachment – If horse owners neglect microcracks in the hoof wall, the cracks can grow and eventually weaken the attachment between the hoof wall and the sole. This can set the stage for discomfort or injuries. Larger cracks – Although superficial hoof wall cracks don’t seem to have any major effects, they are a tell-tale sign that hooves may need extra attention. Horse owners and farriers can tend to these small cracks in order to avoid larger, more harmful cracks. To maintain consistent moisture levels and prevent superficial cracks in the hoof, horse owners can use essential oils or a moisture barrier product on the hoof wall to deflect or retain moisture. This is a common procedure for show barn horses, as owners will apply these products for preventative measures. However, once superficial cracks form in the hoof wall, it is important to treat them as if there are bacteria in them to avoid future infections. If small superficial cracks open up to form larger cracks, pour-in pad materials can be a helpful solution to manage the condition. Equi-Pak CS from Vettec is a supportive material that helps to keep pressure off the hoof wall and strengthen the hoof. It is made with copper sulfate, which helps deflect and retain moisture. The material can be injected under a pad, or used as a pad itself since it bonds well to the sole and frog. 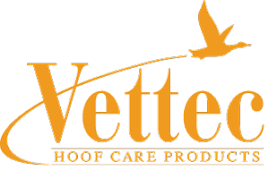 With the spring season approaching, changes in weather and moisture content can make it difficult to maintain optimal hoof health. A regular hoof maintenance schedule and proper trimming is the key to healthy hooves. To ensure a horse’s hooves are in good condition, horse owners should aim to schedule their horse’s hoof maintenance about every six weeks. Whether preventing or managing superficial hoof wall cracks, trimming and pour-in pad materials can provide the support and durable protection needed to heal properly. With today’s modern tools and materials, farriers can help horses maintain healthy hoof function more than ever before.